IKhitron awarded T200353: Filters: Display the time and date of the last refresh a Love token. IKhitron awarded T221655: Make Meta's global preferences include everything a Love token. IKhitron added a comment to T218511: After opening a diff, entry on Special:Watchlist sometimes stays unread (bold). @isaacl mentions: "I'm still having the opposite issue that I mentioned before: diffs being marked as read even though they weren't, but on occasion I also see the issue that everyone else is complaining about regarding diffs that have been read"
IKhitron added a comment to T215293: Moved 100% match was not found (Michgrig bug). IKhitron added a comment to T44085: Wikimedia needs a URL shortener (tracking). Brilliant idea! Thanks a lot. Could you, please, add a Special:Interwiki "ww" wikilink prefix ([[ww:3]] -> https://w.wiki/3)? IKhitron awarded T44085: Wikimedia needs a URL shortener (tracking) a Love token. I can see it once or twise every day since then. IKhitron added a comment to T199534: Confirmation prompt for rollback action (#7 2017). IKhitron updated the task description for T219781: Confirm on mobiles only. IKhitron created T219781: Confirm on mobiles only. 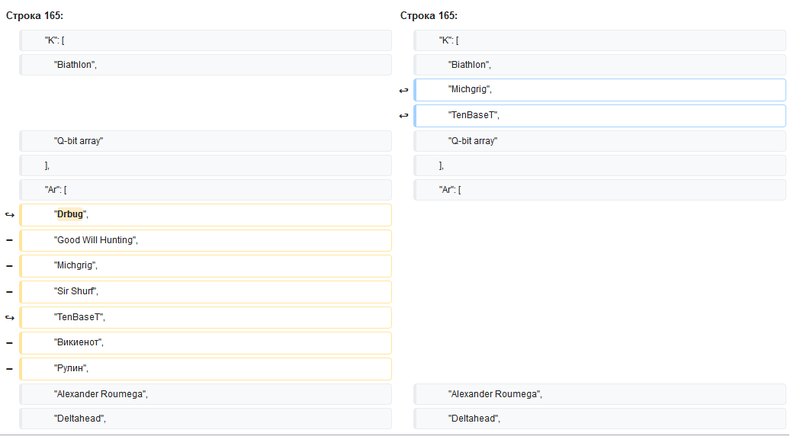 IKhitron added a project to T219455: AdvancedSearch extension changes behaviour of default namespaces to be search for anon and logged in users: Regression. IKhitron added a comment to T206677: 1.33.0-wmf.23 deployment blockers. IKhitron created T219466: Cirrussearch default namespaces destroyed. IKhitron added a comment to T181001: Add task status to phabricator notification mails. Closing as upstream has no plans to dump more metadata into the email body. IKhitron added a comment to T176095: Some shift symbols delete the last word on Android. @IKhitron do you know if this is still a problem ? IKhitron updated the task description for T218511: After opening a diff, entry on Special:Watchlist sometimes stays unread (bold). IKhitron added a comment to T218310: "Bad title" message when publishing page: "The requested page title contains invalid characters: "%D7".". Aklapper, I'm sure that those two are the same problem. You did not understand me. It was Chrome in that report, but because of updating lack, I do not think that browser is the problem. I do not think it's Chrome. A couple of people said thay did not update the browser a lot of time. Do you still want me to ask? There is one complain from March 10. @IKhitron: Any links to discussions? Any info which browsers and browser versions people use? A lot of complains in ruwiki, starting from yesterday. IKhitron created T217137: Remove education program namespaces from cirrussearch. IKhitron awarded T29828: Add "wikitext" as language in Pygments a Like token. IKhitron added a comment to T195375: Show changes in moved paragraphs on most wikis. IKhitron updated the task description for T215293: Moved 100% match was not found (Michgrig bug). IKhitron updated subscribers of T215293: Moved 100% match was not found (Michgrig bug). IKhitron added a comment to T214712: MassMessage delivery of Tech News failing in wikitext on Hebrew Wikipedia. https://he.wikipedia.org/w/index.php?title=%D7%9E%D7%99%D7%95%D7%97%D7%93:%D7%99%D7%95%D7%9E%D7%A0%D7%99%D7%9D&type=massmessage should be the right place. Where is the log, @Johan? I can translate. IKhitron added a comment to T213836: API purge does not work any more. Wait as couple of minutes. Expected and got: The page text will be updated to the API call time. Expected and got: The page category at the bottom will be updated to the API call time. Expected: the relevent category from the the previous paragraph will have the created page name X in it. Summary: the API call does not update categories any more. IKhitron updated subscribers of T195375: Show changes in moved paragraphs on most wikis. Hi there. Is this a bug, so I should open a new phab ticket? Thank you. As you can see, DrBug is shown as moved, instead of Michgrig, two lines below. IKhitron created T213836: API purge does not work any more. IKhitron awarded T60674: Drop page.page_restrictions column from Wikimedia wikis a Like token. IKhitron updated subscribers of T107119: Provide a Lua method mw.templatedata.load(). @eranroz, would you like to review the patch? IKhitron awarded T210665: Auto-add namespaces if search field fully matches their names a Like token. IKhitron added a comment to T210496: Magic word __EXPECTUNUSEDCATEGORY__ should not be displayed on the page. I see, my fault. Thank you. It can't be added until the change is deployed. If added before it's considered normal text, not a magic word. IKhitron awarded T210496: Magic word __EXPECTUNUSEDCATEGORY__ should not be displayed on the page a The World Burns token. IKhitron added a comment to T181141: Timeless list has a huge space between lines. Not until this moment. I think you can make it stalled for now. IKhitron updated the task description for T208723: Add direction directive to default CentralNotice banner. IKhitron created T208723: Add direction directive to default CentralNotice banner. IKhitron updated subscribers of T208074: Other projects interwiki block does not work. putnik awarded T208074: Other projects interwiki block does not work a The World Burns token. IKhitron renamed T208074: Other projects interwiki block does not work from Other projects interwiki does not work to Other projects interwiki block does not work. IKhitron updated the task description for T208074: Other projects interwiki block does not work. IKhitron created T208074: Other projects interwiki block does not work. IKhitron added a comment to T130504: Some users are recognized as bots in recent changes and watchlists. Thank you. I also thought this can be the reason, but it's too confusing, indeed. New message is a good idea. I believe you are right. Something missing. I'll try to reproduce. Or, possibly, it was already fixed unintentionally. That was I saw in "computed" panel in Firefox. IKhitron closed T207456: Warning alternates between default and specified warning do not work, a subtask of T27086: Warning alternates between default and specified warning, as Invalid. IKhitron closed T207456: Warning alternates between default and specified warning do not work as Invalid. Well, it works. I found the problem. Thank you for your help. The problem was that when I changed the name of message, and then choosed "another message" in the popup menu, it returned to "abusefilter-disallowed", probably as a browser bug, so I edited the wrong message. So, (A) can be closed as invalid. I still do not know why did I see the double message in (B), but I can't reproduce it any more. Maybe it was has something with (A), still I can't understand how is it possible. Or some system glich. Anyway, I'm closing the task as invalid now, and if (B) will return, I'll reopen it. Thanks again. IKhitron updated subscribers of T207456: Warning alternates between default and specified warning do not work. Actually, @Daimona, I gave you all that I have. If the problem is on my side, I do not see it. I can't provide such a flag. Let's ask @eranroz. IKhitron added a comment to T207456: Warning alternates between default and specified warning do not work. What info do you need, @Daimona? IKhitron created T207456: Warning alternates between default and specified warning do not work. IKhitron added a comment to T136104: Add time indicators to RevisionSlider. IKhitron created T206451: Special:Watchlist does not refresh Chrome browser cache any more. RandomDSdevel awarded T203661: Old page title is displayed after renaming a page until the page is subsequently edited/null edited a Piece of Eight token. IKhitron added a comment to T205795: Too big notifications bundle is resetted on login. As far as I know, it's on many browsers. Quantum. And F5 is not an issue here, you can open another wiki page instead. IKhitron created T205795: Too big notifications bundle is resetted on login. IKhitron updated subscribers of T96041: Allow excluding soft redirected categories on Special:UnusedCategories. Thanks to @eranroz for calling me. Well, I think it can be very useful feature. But for me, soft redirect isn't the main issue, but tracking categories. There are thousands that we try to keep emptied, and removing them from the special page will be very helpful. About the list of excluded categories, excluded and empty categories, or excluded and non empty categories - I do not really care, because I can use query. But on large wikis it can't cope with this, so these lists can help too. IKhitron added a comment to T205229: MediaWiki:Ext-uls-undo-language-tooltip-text is not parsed. Non text - you mean wikilink? IKhitron created T205229: MediaWiki:Ext-uls-undo-language-tooltip-text is not parsed. IKhitron added a comment to T201340: Local notification settings stuck at latest global preference. I do not sure it is possible. I can tell that if I open now local prefs and change this, I'll see it back in a while. But I do not know how to reproduce the start situation, so it begin to happen. IKhitron added a comment to T204226: Get rid of this ?download=true parameter. Patch merged and deployed, but the problem is not totally solved as said in previous comment. We haven't any idea/can't do anything to resolve your exact problem. IKhitron added a comment to T204492: Support "&shy;" in DISPLAYTITLE magic word when "hyphens: auto;" CSS is not sufficient. X is "auto-hyphenation can hyphenate here, and it's wrong"
V is "it should be hyphenated only here"
X is "auto-hyphenation can hyphenate here, and it's very wrong"
V is "auto-hyphenation can't hyphenate here, and it's wrong"
Sure. And also, there are words where you want to hyphenate in places you decided, not the auto-hyphenation mechanism. So adding this manually will be very helpful. IKhitron updated the task description for T204492: Support "&shy;" in DISPLAYTITLE magic word when "hyphens: auto;" CSS is not sufficient. IKhitron added a project to T204492: Support "&shy;" in DISPLAYTITLE magic word when "hyphens: auto;" CSS is not sufficient: MediaWiki-General-or-Unknown. IKhitron created T204492: Support "&shy;" in DISPLAYTITLE magic word when "hyphens: auto;" CSS is not sufficient. IKhitron added a comment to T85847: Grant editcontentmodel right to all logged in users. This shouldn't be blocking using templatestyles, when creating a new template style (e.g. https://test.wikipedia.org/wiki/Template:389573/styles.css) is is already in the correct content model. Sorry, I do not understand how can it help. I'm not following why developers would be refusing to allow access to communities that have specifically reviewed and requested access for certain groups though? Do you have the phab numbers to review? Of course, here you are: T188287, T187729. And also https://he.wikipedia.org/wiki/Special:AbuseFilter/90 and https://ru.wikipedia.org/wiki/Special:AbuseFilter/168. Seems like a nice to have feature to me, but you can just change it back if abused? Changing content models is even easier to revert than page moves (because of the redirects). If it will be done, is there a way to avoid contentmodel change from something to sanitized css, using abusefilter? As you suggested, without the parameter. It is not urgent know, because you solved the problem with encoding, but maybe you can thing about it. And also about the warning I mentioned. Thank you. Still, you can add one more option. Honestly, I would prefer just get rid if this ?download=true and leave the url as https://quarry.wmflabs.org/run/290198/output/0/html, which works fine despite having the exact same binary contents. Hi, @zhuyifei1999, and thank you. Could you please add an explanation somewhere in the output? N3: About you asked: Last Quantum on Windows 7. I understand your problem. Usually it's OK. But now the bug report goes to one particular person, that know all that. Here is your link: https://quarry.wmflabs.org/run/290198/output/0/html?download=true. IKhitron created T204226: Get rid of this ?download=true parameter. IKhitron added a comment to T191757: Investigation: Edit existing templates. Thanks for calling me, but I'm the wrong person to ask this - I do not work with this wizard. But I agree you should not spend your time on wikEd compatibility. The wikEd gadget has a lot of problems, and I see many complains that it destroys either interface or pages wikicode. Avoiding common work of these two tools is indeed a good idea. IKhitron added a comment to T203661: Old page title is displayed after renaming a page until the page is subsequently edited/null edited.